This photo is bliss. 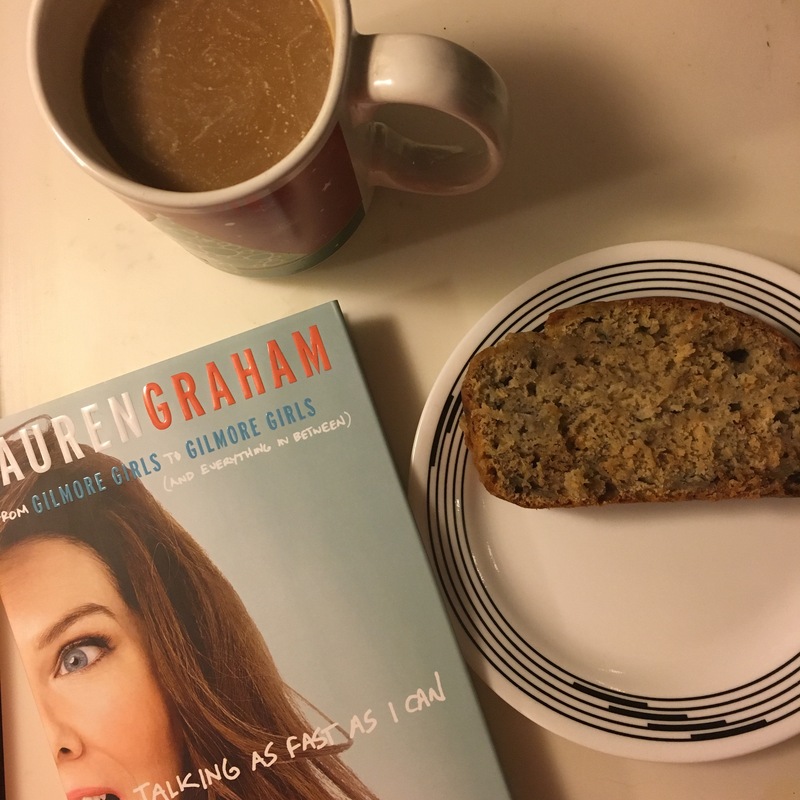 A warm slice of homemade banana bread straight from the oven (the ultimate comfort food to me), Lauren Graham’s awesome journal-style book “Talking as Fast as I Can” and in the spirit of Gilmore Girls, a cup of coffee (yes, this tea lover does enjoy coffee on occasion). • Lauren Graham has had a pretty awesome life, and I would love to have her as a friend. She’s just a cool person in general. I never knew her life story, how she moved around so much, didn’t find love til later on and really took some time to get her career going. • Gilmore Girls played a big part in her life, and the revival was very emotional. I cried at parts while reading her thoughts and feelings, thinking of it all ending but not wanting it to. I didn’t put in all the work she did, but I felt the same way watching the revival after waiting so long for it. • All fad diets are crazy, as Graham says. Now I feel better about just doing what works for me. Now, for the banana bread. I know you’re curious how I made such delicious looking banana bread. Since you stuck around, you get to find out. I had some rotting bananas a few weeks ago and didn’t want them to go to waste, so I made some tasty banana bread out of them. I’ve been trying to incorporate hygge into my daily life, and this was it. The comfort food, a warm beverage and a good book made for a soothing winter evening spent at home. I used Cookie and Kate’s “Healthy Banana Bread” Recipe, which is dairy-free (yay!) and though the ingredients were healthy, it was still delicious! I didn’t add any mixins like she suggested, but I think her ideas would take this banana bread to the next level of tastiness! Preheat oven to 325 degrees Fahrenheit (165 degrees Celsius) and grease a 9×5-inch loaf pan. Then I added all the liquidy ingredients in a bowl and mixed well, afterwards gradually adding in the dry ingredients, put it in the pan and baked it for about an hour. While she said to let the bread cool before eating, I couldn’t resist, and dug in pretty much right away. This recipe is pretty awesome, and you could make it vegan by substituting applesauce, or a flax egg in place of eggs but I just wanted to make it as is. Let me know in the comments below if you try this recipe or have another banana bread recipe you love! Also, if you read “Talking as Fast as I Can,” let me know what you thought of it. I have some bananas in my refrigerator right now that need to be used! !